This blog is about The Big Picture - information and insights about what goes on in the world outside our borders - and what it means for Americans. Unless otherwise specified, all photos from Deena Stryker archive. Reading history books is not the only way to do this. Many films tell forgotten or ignored stories that shed light on what's going on today. "Lawrence of Arabia", although highly romanticized, is an obvious example. But it only reminds us of things we already know. "Khartoum", an equally old technicolor enterprise, tells a story that most people probably didn't pay much attention to when the film came out. Yet it goes a long way toward explaining the crisis in Darfur, and Sudan generally. In particular it shows where the Sudanese government's high handedness probably harks back to: the time when Sudan was a pawn in the power games played by the waning Ottoman Empire, Britain and Egypt. When school means learning Sudanese history instead of British or American history, populations and their leaders are likely to have attitudes that flow from events which we ignore. A disposition for revenge is the least of these attitudes; not accepting to be told what to do by outsiders is the greatest. Both agendas of the Sudanese government are sequels to history. The first, vividly portrayed in "Khartoum" is affirming Islam by the sword, with the result that it currently treats black aminists as less than human. The second is standing firm against U.N. involvement in peacekeeping - which Sudanese history labels as just one more instance of imperialist interference. If you have more faith in books, try reading "The Last Mughal", by William Dalrymple, and reflect on the fact that a vast country like India was for centuries ruled by Islamic Mongol (Mughal) rulers, who were as enlightened for their time as we wish our own rulers were today. I'd like to hear from history teachers as to the urgency of vastly enlarging the scope of our mandatory history courses. The alternative press is replete with despair and ‘hope’, neither of which is helpful. ‘Squawking’ may alleviate some of the pain Americans experience at being identified with a government that brutalizes Others at will, but it doesn’t change the ‘facts on the ground’. As for hope, it is an easy cop-out: in the present state of the world, we can never be certain that tomorrow will come. Whether a barefoot child in Africa or a hedge-fund manager, all of us are the potential victims of hubris. This blog aims to prepare readers in ways more important than stockpiling food and bandages for whatever happens, as we transition from an American century to a world century, helping them see through the web of lies with which we are being controlled. Having lived for years at a time in half a dozen ‘foreign’, countries — learning their languages and histories — I have a unique ability to identify events that bear watching. That life, however, could not provide ‘retirement benefits’, so if you appreciate the unique combination of information and insight that characterizes my work, I hope you will integrate a small donation to Otherjones into your budget. By clicking on the Donate button, you will be able to contribute via Paypal or your credti card. Thanks! 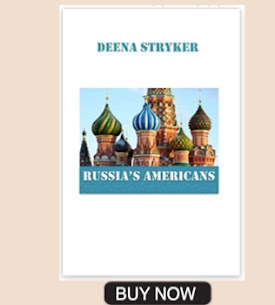 If you’re not quite prepared to believe that the US should go to war with Russia, or even that its President, Vladimir Putin, is a thug — or even if you simply believe that they mean the US harm, check out my new book Russia’s Americans, at Amazon. You will discover that there are many things you do not know about the Russia story, including the fact that thousands of Americans have chosen to live and work there. It is available in both paperback, at $22.25 and e-book, and is illustrated with many color photographs from my May 2017 trip. Born in Philadelphia, I studied in Paris, became a French citizen by marriage, debuted at Agence France Presse in Rome, then, as Deena Boyer, followed Fellini’s creative process for The Two Hundred Days of ’81/2’. The proceeds from this book enabled me travel to Cuba to to interview Fidel Castro for a major French weekly, meeting with him again a week after the Kennedy assassination and several times in 1964 for a book, Cuba 1964: When the Revolution was Young, in which the other members of the government (including Che Guevara, Raul Castro and Celia Sanchez), tell in their own words why they made the revolution. My Cuba archive is on-line at Duke University. In the seventies, I did graduate work in Global Survival, taught at the University of Massachusetts at Amherst and was a speech writer in the Carter State Department, publishing an article on U.S.-Soviet relations in the in-house journal in 1976. Returning to Paris in 1981, with assistance from the Centre National du Livre, I published Une autre Europe, un autre Monde, the only book that foresaw the reunification of Europe and the breakup of the Soviet Union. I returned to Philadel-phia in 2000, and have been a contributor and senior editor at various on-line journals. A Taoist Politics: The Case for Sacredness hopes to change the way both seekers and skeptics look at good and evil - -and at the daunting problems of the 21st century. It shows that religious belief is not necessary to achieve serenity, but that awareness of the sacred as confirmed by modern science, is. It does this by viewing the world as a system and exploring what that means for the role of politics. America Revealed to a Honey-Colored World is a primer for Americans and others who find the policies of successive US governments difficult to square with their image of the country and its founding documents. The decades I spent living on both sides of the Iron Curtain provided me with a unique awareness of America’s image abroad and of the mainstream media’s failure to convey news and ideas to the voters in whose name policies are carried out. References to work by other political writers illustrate little-known or forgotten features of American history that have contributed to the tragic face the country presents today. 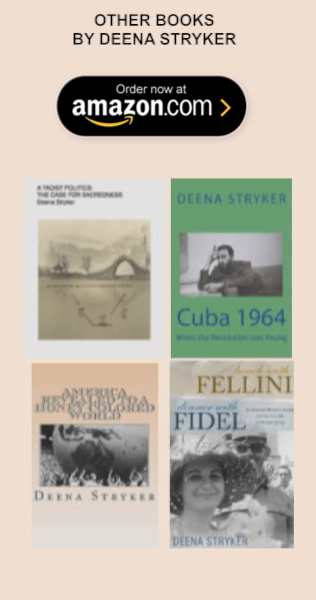 Cuba 1964 provides the definitive answer to the question: “Was Fidel Castro a Communist before he carried out the revolution, or did he become one because of the way the United States reacted when he ousted pro-US dictator Fulgencio Batista? While following day by day events, I had extensive conversations with the men and women who had joined the Castro brothers as early as 1953 and were now members of the revolutionary government. Together with Fidel, Raul, Che and Celia Sanchez, they told me in their own words why and now they made the Revolution hat continues to inspire countries in Latin America and around the world. The text is illustrated with photographs from my black and white archive which can be seen on-line at Duke University. Lunch with Fellini Dinner with Fidel: How did it happen that a fourteen year old American girl found herself living among the French in post-war Paris? The answer to that question also explains why I went on to live in half a dozen countries on both sides of the Iron Curtain, becoming mutti-lingual, writing first about the cinema, then about ‘the big picture’ while raising two children, mostly on my own. A religious grandmother and a hedonistic lover accompanied me on a journal which has been both spiritual and political, and is illustrated by many photographs from my personal album.